NEW: 03/02/2016 Super Network Tunnel 4.5.0.0 Release! 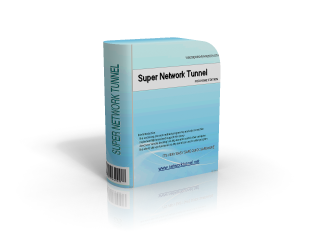 Super Network Tunnel is professional http tunneling software, which includes http tunnel client and server software. It like a secure VPN software that allows you to access your internet programs without being monitored at work, school, or the government and gives you a extra layer of protection against hackers, spyware , or ID theft. It can easy bypass any firewall - Surf, IM, P2P, Game, etc. It is easier than VPN, no complicated settings, portable, plug and play, and can support http proxy, normally complete a tunnel config within 10 minutes. Despite other http tunnel software, Super Network Tunnel is really two-way http tunnel software. The client computer can access the server computer's network and control the server's computer. It can run any game/IM/P2P/Stock software via server's network. Also the server computer can access the client computer's network and remotely control the client's computer visa. To simplify your configuration, Super Network Tunnel integrates a function similar to 'sockscap', you only need to select the program, drag&drop it to the tunnel program list then run it, that's all. By comparison with the subscription http tunnel service, Super Network Tunnel can give you higher safety, because your private data is not transferred through the provider's network. Many http tunneling service providers provide poor speeds for http tunnel, but if you use Super Network Tunnel, you will get the whole bandwidth of your server's network for you! Super network Tunnel is equal to SocksCap + Bidirectional Http Tunnel + Remote Control. It's the first two-way http tunneling software in the world. Native code, top speed and performance, can tunnel TCP/UDP, compression and encryption data. Support NTLM http proxy, support Vista/WIN7/X64. Automatic dial-up support ,provide dynamic DNS client refresh function. Unique support network neighborhood (Samba) over http tunnel. "Tunnel" the entire system (include 32bit applications and 64bit applications) and support virtual network adapter, TCP/UDP port mapping and local socks5 proxy. Resolve DNS names through a proxy server (fake mode) and also support real remote DNS resolve (some game need run in this mode). Support tunnel use N-Protect GameGuard protected games and use AhnLab HackShield protected games. Can share tunnel with other computer and support remote file manager. Supports multi-user, bandwidth control, up to 1000 client pc, can serve as a corporate http tunnel VPN solution, with Super Socks5Cap, also can serve as a site to site http tunnel VPN solution. Here is flash drive portable version(7Zip Format) (Include a free HTTP Tunneling client SDK) not need install, can be run from removable media such as USB stick, floppy, etc... and not need admin rights, support Win95/Win98/Win2000/Win2003/WinXP/Vista/Win7. Super Socks5Cap like 'sockscap' , is a program that allows network applications that do not support working through proxy servers to operate through a HTTPS or SOCKS4/SOCKS5 proxy server or Super Network Tunnel Client/Server proxy (Super Network Tunnel Proxy is a full function type proxy, can support pure http proxy, not support https and support NTLM identification, and can connect to any destination port to bypass firewall ) or SSH Tunnel. Like 'sockscap', tunnel TCP / UDP connection , but it support Vista and Windows7/8/X64, and can tunnel 64-bit applications. Support five types of proxy servers: SOCKS v4, SOCKS v5, HTTP (Support HTTPS CONNECT), Super Network Tunnel Client/Server Proxy, SSH Tunnel. 'Tunnel' the entire system (force all network connections in the system work through a proxy server). Built-in support for SSH tunneling. Support work through a chain of proxy servers using different protocols. Support HOOK/LSP/ Virtual network adapter and port mapping three engine, with it can almost tunnel all games and run it anywhere. Ssh Tunnel Easy is an innovative SSH tunneling software, it can make an encrypted SSH tunnel between your machine and SSH server host, then tunnel your program TCP connection automatically through this encrypted tunnel to data forwarded. It help you surf securely in the internet. A simple all in one solution, you do not need a complex sockscap/firefox + autoproxy + myentunnel + putty combination, and only a few mouse click, all config completed. Auto reconnect, support https proxy and NTLM authentication. Unique support use network neighborhood over SSH tunnel at vista/win7 x86/win7/8 X64. Under normal circumstances, because the SSH server is limiting the number of simultaneous connections, if you have too much TCP concurrent connections in one tunnel, may be cause your SSH tunnel freeze. Therefore, SSH Tunnel Easy use similar to IE's LCIE (Loosely-Coupled IE) multi-channel load-balancing technology to improve it. In other words, Ssh Tunnel Easy will automatically create multiple SSH tunnel, then your browser's TCP connections will automatically be distributed to each SSH channel average, so that each channel ssh connections will not be too much, solve this problem perfect, and it can also significantly speed up your browsing speed. The suite software include game socks5 server and super socks5cap command line version. Linux-threaded architecture, high performance, according to the configuration file limits the number of client connections and traffic etc, and can auto refresh the configuration without restart s5 server. Support p2p UDP, and can support DNF team collaboration, newest beta StarCraft II, WOW etc. Analog session concept, can accurately know the user is online or offline and send bytes, receive byte, bandwidth etc and easy disconnect users. Portable, not install, support WOW, AION etc, steady and rapid, work fine at vista/win7/8/X64, can easy embedded to your client program only a few line codes.